← Naked with Wet Feet. Two of the babies peeking out. 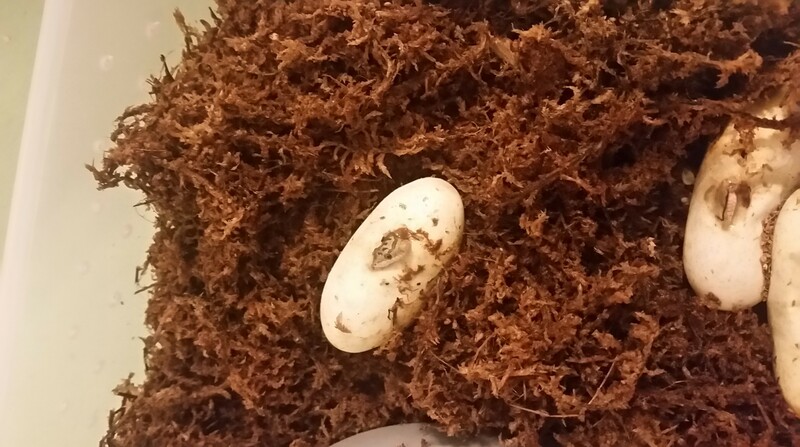 The clutch is finally hatching! These silly babies are like a month over due. Have I mentioned the babies before now? I don’t recall and I don’t feel like looking back over previous posts. I think these are green rat snakes but I could be wrong. I’m just an innocent bystander, they’re my husband’s hobby. Though, for a year, I was mom in charge while he was stationed in Turkey. At that point in time, he had a collection that, including babies, topped out at about 100. It would take me an entire Saturday to feed everyone. Then I had to play with new babies to get them used to humans. And by playing I mean holding the little rascals, letting them crawl all over my hands. If I had a nickel for every time one of them bit the skin between my thumb and index finger…. I hope everyone had a lovely Hanukkah and Christmas. I took too many days off work and played with company. Any weird gifts? The strangest thing we got was…well, I don’t think there was anything strange this year. We discovered a nifty video game called Never Alone. It’s a gorgeous 2 player with fascinating stories and history of Alaskan natives. Check out their website and read up on how the game came to be. A great lesson on not letting someone tell you something can’t be done. Chapters 1-17 are done. (I rewrote 15-17) Ch 18 needs some work but is completely outlined. Ch 19 is done. Ch 20 might be done. Ch 21 needs a bit of work. Chs 22-24 are just in outline stages still. My editor has me giving her daily updates with the goal of sending her the manuscript on Jan 2. We’ll see. It will be a push because I have commitments on new year’s eve and day. No, not the drinking kind! Did you get something weird for Christmas or Hanukkah? This entry was posted in Critters and tagged baby snakes, clutch, editing, June Nash Mystery, Melissa Banczak author, mystery, Never Alone game, snakes, writing. Bookmark the permalink. 3 Responses to New babies! Not too weird but Very Interesting! I was given one of my late Grandmother’s vintage cookbooks. Titled “Woman’s Home Companion Cook Book” published in 1942. Among the odd chapters are: Cleaning and cooking game, Nutrition the 8 food groups, Pictures of proper table settings, and a Wartime Postscript relating to rationed ingredients. My Grandmothers were fabulous cooks, I like to think I inherited their skills! I found many handwritten recipes and notes along with newspaper clippings from that era. The most interesting being “What To Do In Case Of An Atomic Raid! !” Liver was 39 cents a lb. Ground meat 29! An add for Chesterfield Cigarettes, too! How our world has changed. With close to 1000 pages I’ll be into this cookbook for a while. Checked out Never Alone–Beautiful! Stayed home and safe last night. Cooked a pork roast in Sam Adams Beer–Outstanding! Happy New Year…I have a feeling it’s going to be a GOOD one. Write on Melissa! what an amazing gift. Did your grandma leave notes in the margins re: what she thought of different recipes? I love things that connect people through time. One of my favorite past times is searching for vintage postcards at antique and junk shops. Of course, I thumbed through some vintage photos once, at this shop, didn’t see anything I liked, and days later someone found photos of F Scott Fitzgerald in that same pile. I kick myself for not remembering what the hell he looked like. Those photos sold for a pretty penny too.